I am hopelessly addicted to Angry Birds on the iPhone. Thanks to Aprille, I blew my way through the free version and am working my way through the paid version. I just downloaded the Halloween version even though it's almost December. I have gone on to infect Aaron, Tina and my mom with the Angry Bird flu also. I love all the spin offs from Angry Birds - check out this Angry Birds cake, a very cool ornithological illustration of the Angry Birds and this video of the Angry Birds/Pigs peace treaty (warning - the birds drop the f-bomb). One of the things I like best are the stuffed Angry Birds and pigs that you can buy. What a great holiday gift! 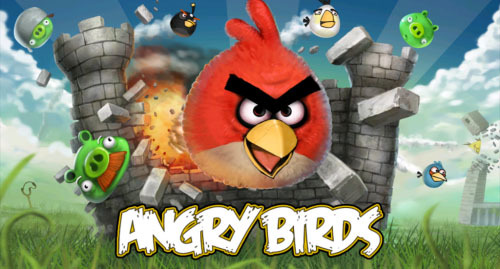 Ooooh, I recently got hooked on Angry Birds. It's so addictive. Get the pigs!! Can't wait for the Xmas version! Would be great if they did one for Wii! That was one of the first things I got addicted to with my iPad. Did you play the Halloween version? OMG I love those little plush birds & pigs so much! I'm so hooked on Angry Birds! Did you hear..it's coming to Wii! So fun!